Room integrity testing is one of the most important aspects of any fire suppression system. If a protected enclosure has a suppression system, the agent that is discharged into the enclosure has to be able to remain there for a minimum period of 10 minutes, from the initial activation of the fire alarm or alert. The performance of any protected room and fire suppression system can only be guaranteed when serviced regularly through a professional maintenance routine. APT always recommend that room integrity testing is made part of an annual service and maintenance package, to ensure that on discharge, the suppression agent achieves and maintains the correct concentration, at the appropriate height for minimum required timeframe. In many instances although the room may be quite air tight, the enclosure may fail as the distance from the structural height (the ceiling) of the enclosure may be very close to the top of the protected height – the top of the server racks. When designing a protected enclosure it is always best to allow plenty of distance between the top of the protected height and the ceiling as this should result in more retention time, as long as your enclosure is sufficiently airtight. In ISO 15004, it clearly states that an enclosure must be integrity tested annually when protected by a gaseous fire suppression system and/or alternatively when alterations are made to the structure of the enclosure such as the introduction of new cable or mechanical runs. At APT we provide room integrity testing for a wide variety of types and manufacturers of fire suppression systems, whether it is part of a system installation or annual inspection or intermediate post work testing. Our engineers use the latest high powered fan technology to test all types and sizes of enclosure from small server rooms to large data centres. If your enclosure fails the room integrity test we can undertake a smoke survey and produce a detailed report to highlight the air leakage paths, this allows your site operatives to accurately seal the areas of air leakage. 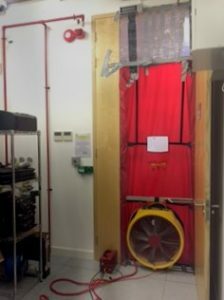 The Door blower fan” Room Integrity Testing methodology provides a means of predicting the retention time without the need to release the extinguishing gas. The blower door fan test methodology is in accordance with the general requirements specified in BS 5306, BS:ISO 14520, NFPA 12A, NFPA 2001 and the BFPSA Code of Practice for Gaseous Extinguishing Systems. Small pressure differentials between the enclosure and surrounding areas by locating the fan equipment is in the data centre doorway. Pressure and depressor airflow measurements are taken, from which the leakage characteristics of the enclosure are established. The predicted retention time is calculated from these leakage characteristics and the enclosure and extinguishing system data. If you are looking for a unique and practical way to really make the most of your windows and still maintain your privacy take a look at some of the attractive, good quality plantation shutter designs available at the beautiful Shutter Company. With a wide range of styles, colours and materials available you can be sure that they will be able to provide you will an individual plantation shutter design that will complement the rest of your interior decor perfectly. Plantation shutters are an excellent idea for homes and businesses alike as they not only add a touch of class to any room they also help to protect against the elements and make you property more secure. With options ranging from full length solid style shutters to half sized cafe style designs no matter what kind of style you are hoping to create within your room you can be sure that at the Beautiful Shutter Company you will find the ideal plantation blind to help you finish the look. Being able to prove that your company puts health and safety as a high priority across all working practices is an ideal way to give a really good impression to prospective clients, so achieving a nationally recognised accreditation such as CHAS registration could be a really good idea if you want to help your company take the next step. Across many industries it is a legal requirement to have reasonable working practices in place to ensure health and safety standards are maintained, so achieving CHAS registration is also a really good way to make sure that your company is complying with all relevant legal obligations. Although at first glance achieving CHAS accreditation can seem complicated and time consuming especially if you have no experience, but by using an online health and safety accreditation service such as beAccredited it can more straight forward than you may expect. 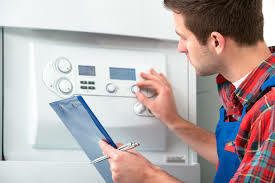 With an easy to access service on offer and a simple to use website that give you all the information that you need to make sure that you will be able to achieve your CHAS accreditation they will be able to help you get the whole process completed with the minimum of disruption to the work your business undertakes. If you need any further information or help to make sure that you have all the documentation required to complete the CHAS registration process at beAccredited they will be able to offer you all the assistance you may need, and if you are concerned about any training gaps within your work force beAccredited will be able to help you identify them and find ways to help you develop strategies to combat them. So you will be able to complete your CHAS registration with all the support you may need at every stage. As they help many companies across a wide range of industries get the health and safety certification they need every day by using the services available at beAccredited you will be able to benefit from the expertise and knowledge that they have and save time and effort researching and looking for information. Even if you work within an industry that requires specific guidelines or are a small business just starting out and need a little extra help at beAccredited that will be more than happy to make sure that you achieve the CHAS registration you require to help your business get to where you want it to be. There are a wide range of benefits to businesses that hold CHAS registration along with being able to offer tender for a wider range of jobs you will also find that you will reduce the amount of administration time required for jobs as well, which will be a massive advantage as your workload starts to increase! So why don’t you take a look at how beAccredited can help you achieve CHAS accreditation easily online today? With a reasonable price scale that is tiered according to the size of your busy, a simple to use online service and an excellent range of health and safety accreditation programmes on offer no matter what industry you work within you can be certain that you won’t be disappointed. So if you are hoping to make the next move in your career and feel like trying something new why not take a look at some of the services offered by specialist recruitment agencies and see what senior and middle management posts they have available? So if you are interested in obtaining health and safety accreditation for your business and would like to find out more about beAccredited and the services they offer to help companies achieve CHAS registration and other relevant certification why not get in touch and see what they can do for you? With a wide range of health and safety accreditation courses available you are certain to find something that is perfect for the industry you work within, and with a great reputation built from many positive previous customer testimonials you can be sure that they will be able to help you achieve excellent results.